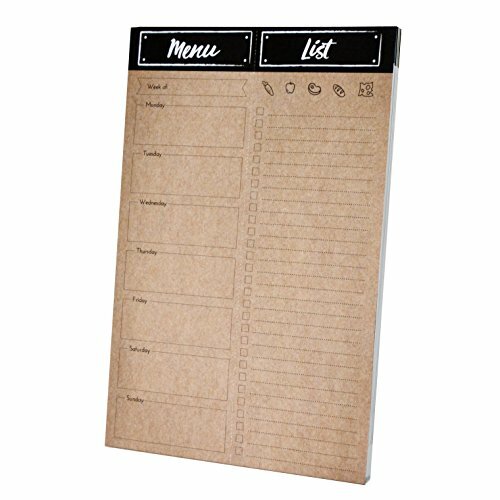 Home Advantage - Weekly Meal Planner Pad with Tear Off Grocery List and Magnet (Kraft) Made in the U.S.A.
Simplify food scheduling and meal planning with this kitchen weekly meal planner and tear off shopping grocery list notepad. The 6 inch x 9 inch pad is perforated down the center with the left side dedicated for the weekly menu and the right side for the grocery list for the week. Easily tear the page down the perforated line to take the shopping list with you to the store. A cardboard backing and magnet allow for the list to conveniently be mounted on your refrigerator. Each pad contains 52 sheets so you are set for each week of the year. QUALITY: Designed and Made in the U.S.A. If you have any questions about this product by Home Advantage, contact us by completing and submitting the form below. If you are looking for a specif part number, please include it with your message. Custom Scriptures Notebook Personalized Stationery - 50 lined pages- Durable cover and spiral bound. Size: 5.5x8. Made in the USA.